Is she right to criticize her attackers? The model during the recent MBF Australia week. 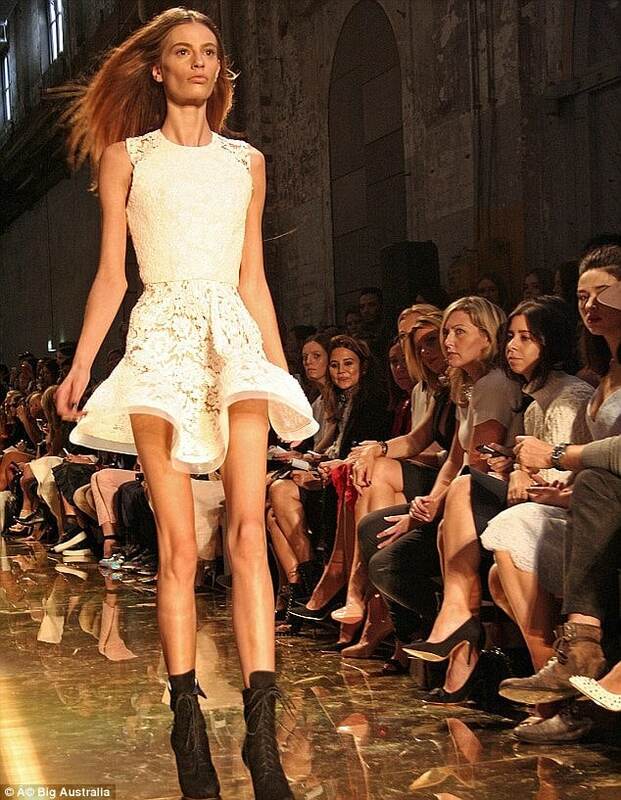 Fashion model, Cassi Van Den Dungen has hit back at her critics after a slew of commentators judged her for being anorexic, too thin and perpetuating unhealthy eating habits after her recent appearance during the Mercedez Benz Fashion Week Australia. At the time the Australian Next Top Model runner up’s appearance had many contemplating whether fashion designers were sending the wrong message to women by choosing to book the ultra waif thin model with many aghast with her deeply sunken cheeks and protruding bones. 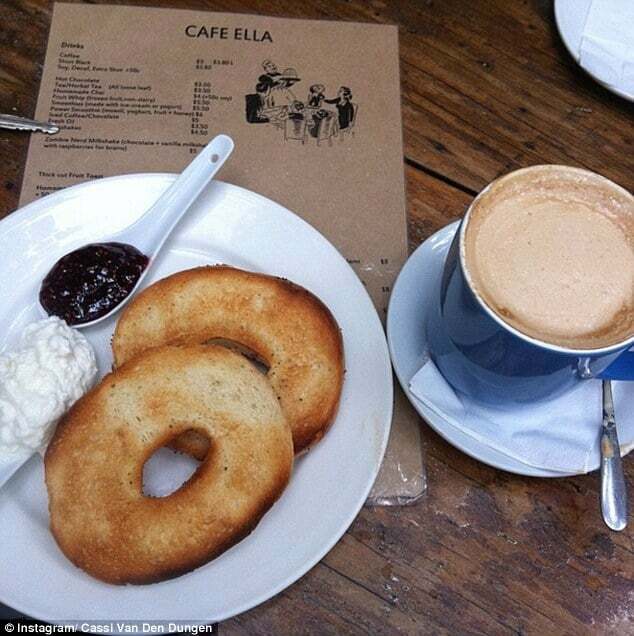 Perhaps in an effort to prove that she does maintain a healthy lifestyle, and eats plenty the model has also posted images of her meals. 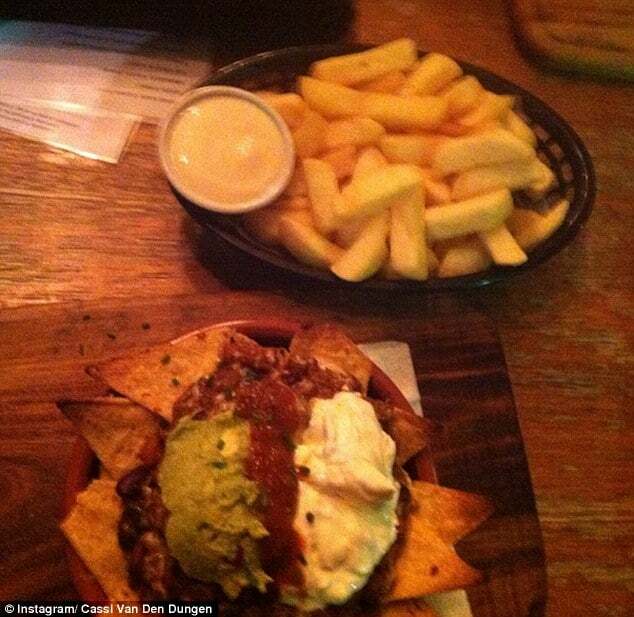 From bagels with cream and jam and nachos and fries. Although one wouldn’t be remiss if that too might be all staged and a publicity stunt as well, lest we all forget the business that Cassi Van Den Dungen perpetuates in. 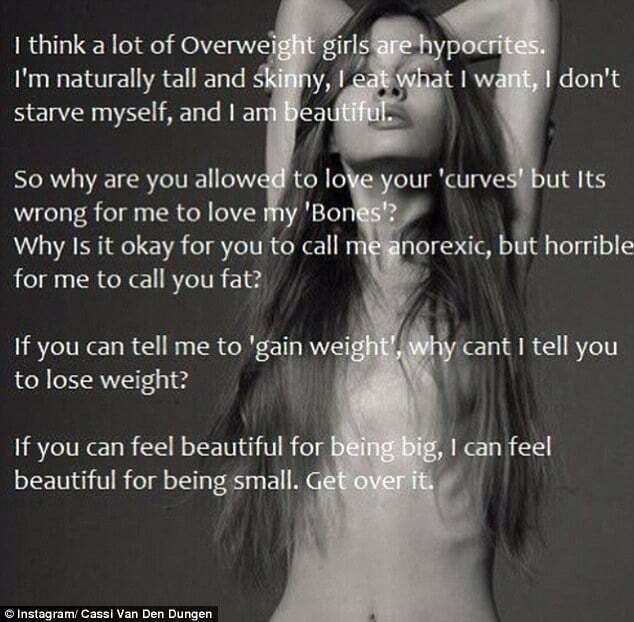 Perhaps it’s true, being ultra thin might be beautiful to many and being obese on the other hand might be beautiful to others, but then that too leaves open the question why are we celebrating the extreme in society and not coming to terms with the fact that some models are too just too damn thin for the audience that they are meant to be showing for. Which is not to say thin can’t be beautiful, but then again who is Cassi Van Den Dungen really modeling for if not the average woman or is that just an illusion being perpetuated by the fashion industry too like the pictures of bagels and cream cheese on the side? The return of the anorexic model. UK’s Top Shop busted! Israeli Lawmakers Says No To Underweight Models. Another ad banned, this time British designer, Drop Dead chastised for featuring emaciated model in bikini. Androgynous model Andrej Pejic explains how he is forced to diet to keep his 25 inch waist. Welcome to the disease known as manorexia. Men who strive to look like male models.